Heartwarming, delightful, hilarious and emotionally charged, this book was a fantastic read! This is the first book I've read by the writing duo, Fenton and Steinke and certainly won't be the last. I cannot wait to get lost in more of their literary works. A compelling tale of of righting the wrongs of past regrets and living with the consequences... or are things better left as they are/meant to be? Deep and thought provoking, examining real life issues that all women will face at one point or another throughout their life. This is the story of three best friends who just turned 50, partying it up in Vegas and are given the chance to go back to when they were 40 years old--and stay there for 1 year to change things they now regret. Do they stay? Do they go through with it? AHH! Hello, butterfly effect! 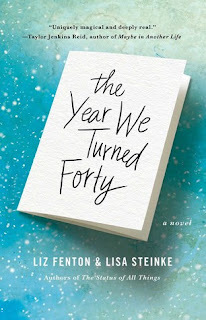 The Year We Turned 40 is captivating and addictive! I couldn't flip the pages fast enough, devouring this beauty is less than a day. A must read!